In the present generation of smart phones , everyone cares for a good camera. 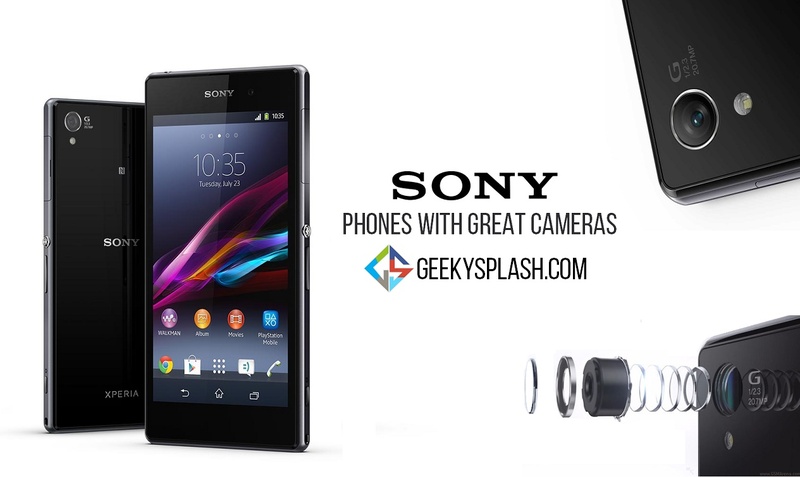 Sony smartphones offer finest cameras and has a superior image quality compared with other smartphones. Sony uses many sensors that no other mobile company has ever done and many companies use Sony camera sensors instead. Samsung Galaxy S6 adds up to this list. Sony Xperia Z1 is the best among Sony smartphones and is claimed to be the world’s highest resolution smartphone featuring 20.7 MP Rear Camera. Though it is not a mobile with a highest Megapixel count , it really gives a superior quality images as a good picture quality is not based on the megapixel count and merely depends on a good sensor and aperture size which Sony is strong with. Sony claims Xperia Z1 camera as intelligent as the human eye. Produces sensitivity by noise reduction to reproduce every splendid detail with precision. Many smartphone makers including Apple , Samsung , Xiaomi etc used Exmor sensor in their mobles. This award winning lens from Sony helps for taking shots in low- light conditions. It uses various algorithms for vivid fidelity in every shot. It creates a balance of brightness by enhancing colors with rich layers of texture and depth with help of Sony G Lens. Apart from Sony Xperia Z1 even Xperia Z2 and Z3 are almost same with Camera specifications . Sony Xperia Z3 comes up with a 4K quality Video Recording. Though all the Sony Xperia Z Flagship focused on the rear camera , Sony was the first smartphone maker to make a mobile for taking selfies. Sony debuted the PRO Selfie smartphone Xperia C3 with a 5MP Front Camera with a LED Flash ( which was the highest Mega Pixel for a Front Camera then ) during mid 2014. Sony Xperia C3 stood up as the best seller among Sony Smartphones and later rest all smartphone makers followed this trend of increased front camera resolution. However increased front camera doesn’t mean giving a vivid image as said earlier it solely depends on merely on a good sensor and aperture size. I guess Sony Xperia C3 is the first smartphone to have a Exmor sensor for the front camera. Sony Xperia C4 carries almost same specifications of Sony Xperia C3. Some of the specifications of Sony Xperia C4 camera at glance.